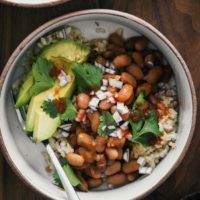 Spiced Pinto Bean Bowls with Avocado | Naturally. It may feel like I’m phoning it in with this recipe but I assure you I’m not. I professed my love of these spiced pinto beans in my last post but I wanted to share how simple it was to use these beans. Enter these pinto bean bowls. The base is still rice and beans but these beans are so delicious, you don’t need much else. Of course, what’s a solid bean bowl without all the toppings? 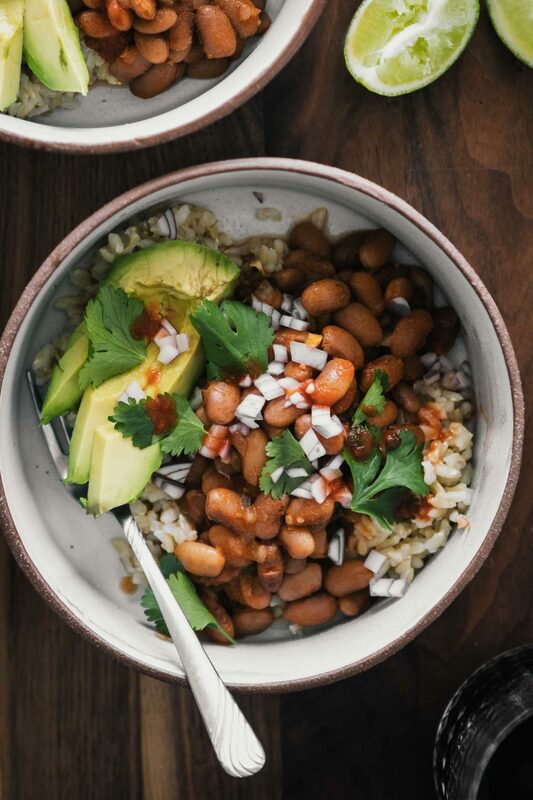 Top these pinto bean bowls with avocado, salsa, hot sauce, onions, roasted vegetables, cheese, and/or a sauce. 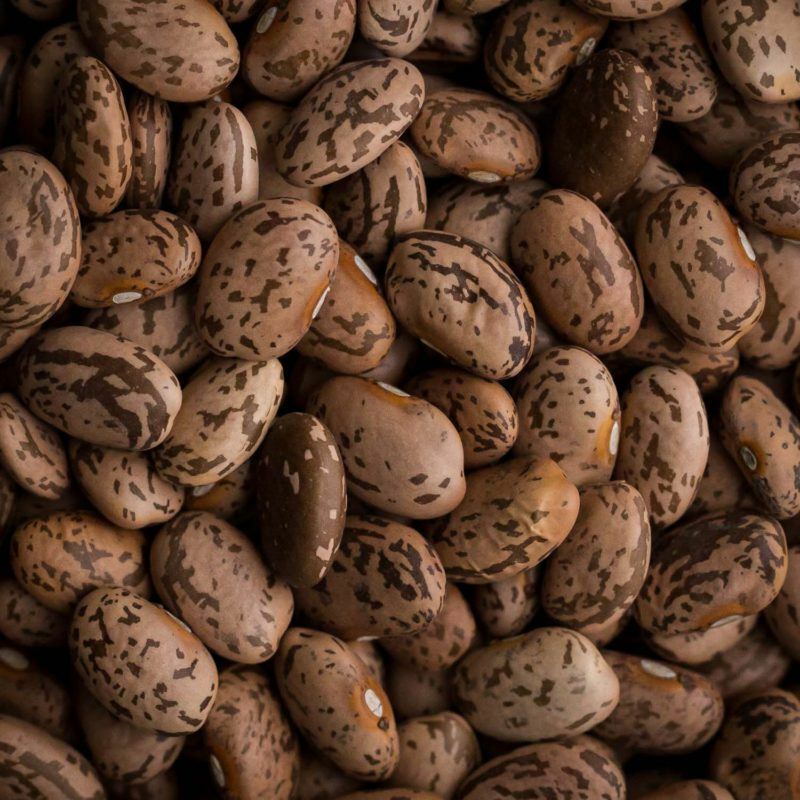 There’s so many different possibilities- all with these simple pinto beans. 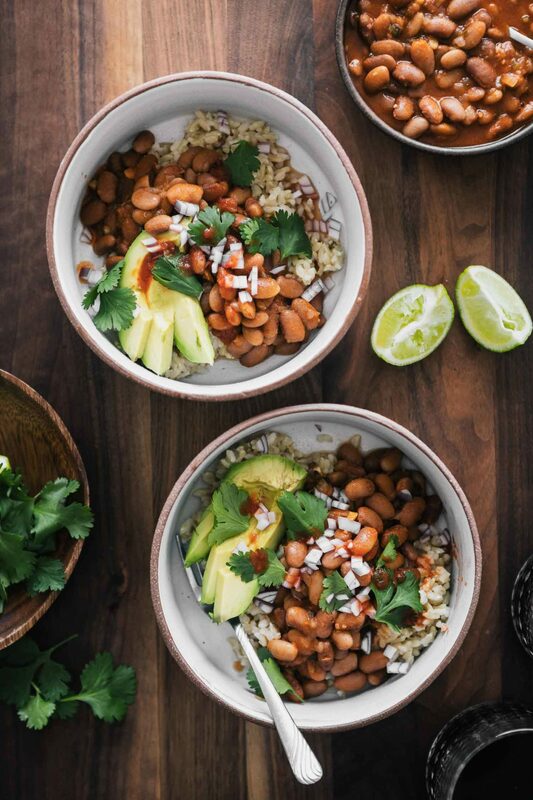 An easy bean and rice bowl featuring my favorite spiced pinto beans and creamy avocado. Prepare spiced pinto beans according to directions. Top rice with beans and serve with your favorite toppings such as avocado, red onion, cilantro, and/or hot sauce. Tips + Tricks: Swap out the rice for leftover grains. Grains: I’m a tad traditional with my brown rice but these beans would be nice with a quinoa or millet base. Cheese: I chose to leave these bowls vegan but this recipe is delicious with a sprinkle of salty cheese (think queso fresco, cotija, or feta). Wraps: Need a meal on the go? Wrap all this deliciousness up into a tortilla and pack it away. It reminds me a bit of these black bean burritos. Sometimes things are just too easy! This is definitely happening this weekend 😉 I have 4 or 5 pounds of pintos that I need to cook up. Thanks! Last night I was telling Matt we should eat more beans and less tofu/tempeh/seitan…..enter: Pinto Bean Bowls. So easy and so pretty and yummy it is just ridiculous. Thanks!